Chemistry is the core science—the study of the properties, composition, and changes that occur in matter. When you study chemistry, you analyze issues that influence every aspect of life on Earth. We offer two degrees, each backed by a strong curriculum that will give you the knowledge base you need to successfully pursue the discipline. Bachelor of Science – If you are targeting a career in industry or planning to attend a graduate program. Bachelor of Arts – If you are seeking work in medicine, dentistry, or secondary school teaching. Throughout your courses, you will regularly work with the modern instruments in our campus laboratories. This equipment includes infrared, nuclear magnetic resonance, and atomic absorption spectrophotometers. Separations equipment includes capillary electrophoresis, gas chromatography, high pressure liquid chromatography, and fast protein liquid chromatography equipment. Detectors range from mass spectrometers, electron capture, and flame ionization to rapid-scan UV-Vis spectrometers. You will also learn skills in computation and presentation of data. While the theoretical training you’ll receive in lectures is important, you will also be encouraged to explore, discover, and ask questions in your laboratory training. Through integrated research questions and hands-on exploration in courses, you will be involved in discovering and contributing new knowledge to the scientific community. Independent studies or full-time summer research is excellent preparation for real-world scientific or health-related work post-graduation. Explore the frontiers of chemistry with one of our research active faculty, stretch yourself with an internship in the Ventura County Crime Lab, Amgen, or a research experience off-campus. You will gain exceptional experience, explore the thrill of discovery, and engage with the larger community of scientists at research conferences and the Cal Lutheran Festival of Scholars. Our research labs are entirely staffed with student researchers to generate data that is published in international journals and presented at national conferences. Talk to us about whether there is an open project in our labs! Working with Dr. Kingsbury has been eye-opening, to say the least. Every day has been an adventure in learning all the advance techniques professional chemists employ in expertly manipulating materials. My experience has grown greatly since the start of my research endeavors. The professors have definitely been helpful and encouraging students to pursue graduate schools or careers. If you want to go into a certain profession they will help you do that. They'll tell you what you need. They do everything they can to really help you through the process. They're not just a research mentor but a life mentor, basically. It's a really great bond that you're able to form with the people who've gone through it before. They've done Ph.D. programs. They've done research. It's really good they're there as a support system for you. 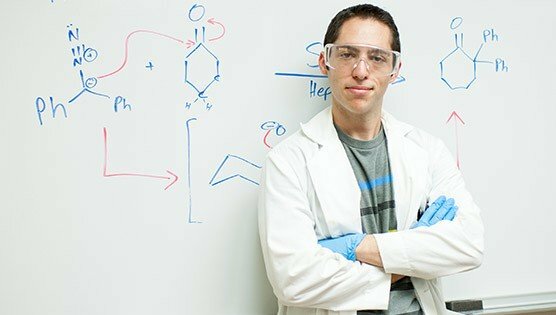 Our chemistry program has a 100% placement record into graduate schools, many of them among the most respected in the nation. Students not going on to graduate programs in chemistry often opt for health-related programs such as medical or pharmacy school, or physician’s assistant programs, while others seek out teaching credentials. 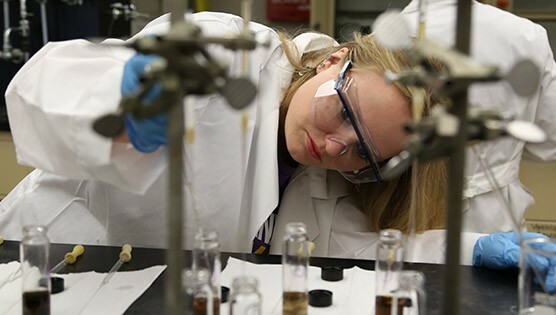 Chemistry majors who enter the workplace after graduation begin their careers in fields such as environmental controls management, consumer product research, drug discovery, toxicology, and forensic chemistry.